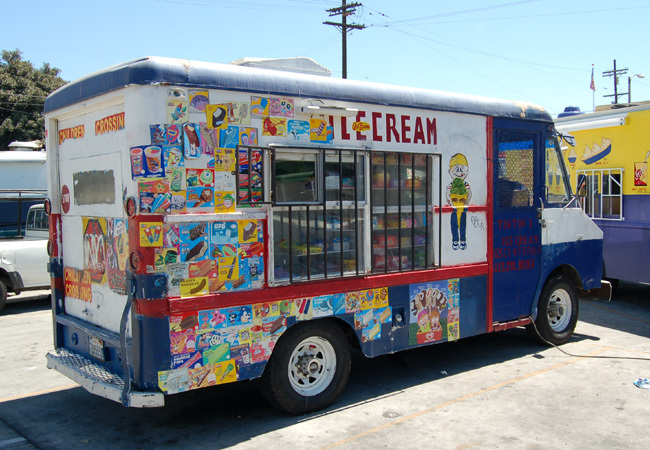 The ice cream truck is a familiar sight and sound on the residential streets of central Los Angeles. Frequently retrofitted from postal service trucks and hand painted to attract attention, the boxy trucks are a unique form of transient commerce. The majority of trucks are operated by individual owner/operators and each follow their own path through the city in search of customers and lucrative areas of congregation. Before heading out into the streets the trucks collect at privately run ice cream distribution yards where bulk supplies are purchased and water hookups are available for clean up at the beginning and end of the shift. This photo survey documents several of the distribution yards along central avenue in Los Angeles where ice cream trucks begin and end their day.